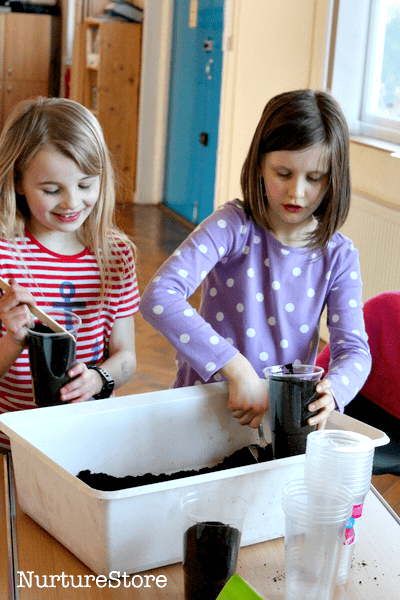 In this sunflower seed growing lesson plan for children we get to see what happens under the soil when a seed germinates. 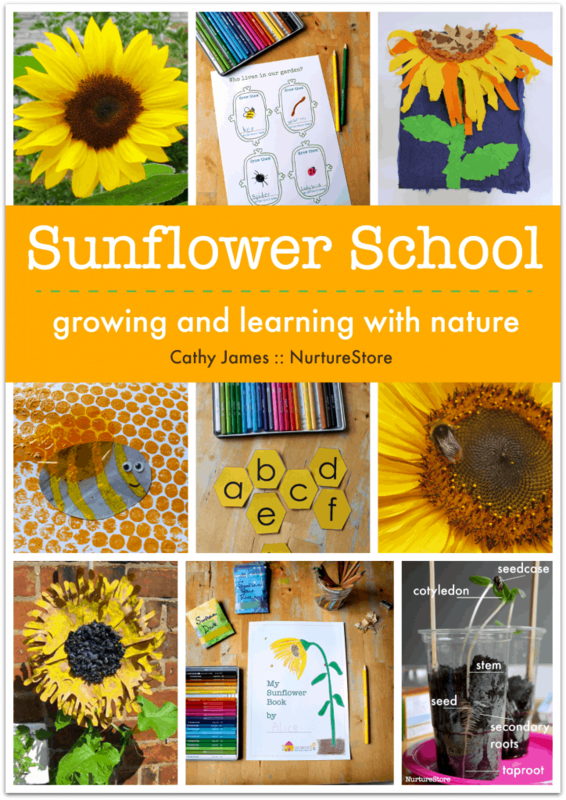 Plus, join the NurtureStore Sunflower School and get lesson plans and additional resources for a sunflower thematic study. Click here to download your copy of the Sunflower School curriculum and printables. 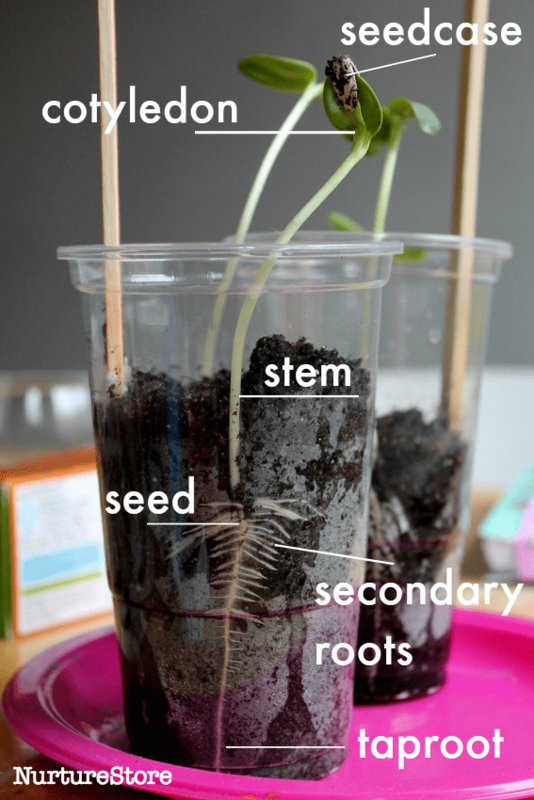 In this lesson you will get to see what happens under the soil when a sunflower seed germinates. 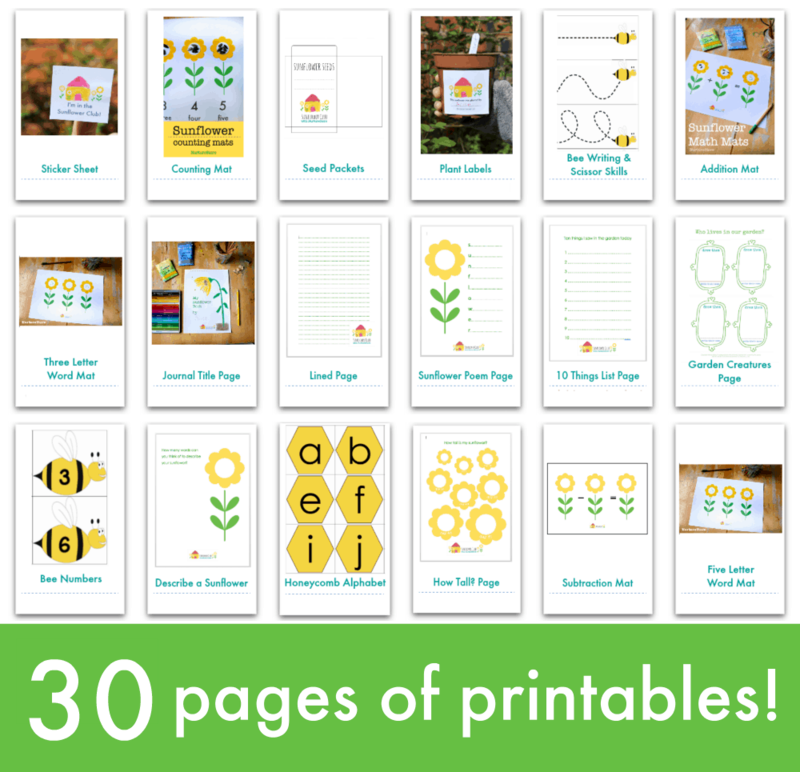 You’ll learn the parts of a sunflower plant and find extra resources for sunflower-themed learning, including lots of great printables! Let’s begin by using our senses to investigate our seeds. Take a good, close look at them – you can use your sunflower journal to draw your seeds and make some notes. What shape is your seed? Does it have any markings on it? What does it feel like? Is it smooth or textured? Can you peel off the outer casing of your seed and have a look inside? Can you think of any seeds that you like to eat? How are seeds like animal embryos? What are the differences between the two? To start your experiment, decide what you want to use as your ‘soil’ and use it to fill a glass or clear plastic pot. For the best view, you can use cotton wool, scrunched up tissue or kitchen paper. This won’t give your little plant sufficient nutrients to develop into a strong plant, but it is a great way to get a good view of a few seeds as they germinate. If you want to plant your seedlings and grow them on, it’s best to use soil or compost. Whatever you decide to use, dampen it down with a little water, and pop your seeds inside. Place the seeds at the edge of the pot so you can get a good view of them as they began to grow. 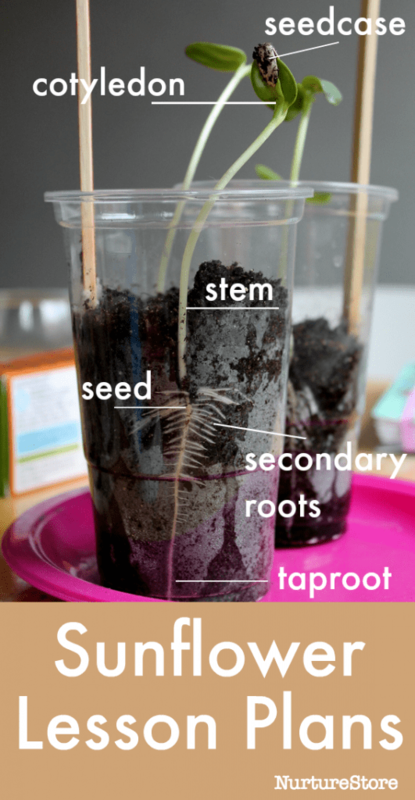 Germination is the process by which a plant grows from a seed. A seedling is a young plant grown from a seed. :: how long does it take for something to start growing? :: how long is it before there is a leaf? :: how long before there is a flower? :: how long before there is something to eat? You could ask everyone to guess the answers to each question and record their predictions in your Sunflower Journal. You can record your seeds progress in a number of ways, depending on how detailed you would like to be. :: You can keep a photo or sketch journal, making a picture of each new development and a note of the day it happens. :: You can draw out a simple number line and count along the days, making note of germination, first leaf etc. as you go along. This is good for younger children who simply want to count. :: Older children can draw a tally chart, or a bar graph to compare a several seeds alongside each other. You can also make a graph with a x-axis showing the number of days and a y-axis showing the height of your plant. :: Make a sunflower height chart to track who’s taller: you or your plant? When the seeds begin to grow you can take photos and draw pictures of what you see and there’s lots of opportunity for discussion too. You can follow germination, when the seed first starts to grow. Then the appearance of roots and the stem. The first leaves are called cotyledon, with the true leaves coming a little later. I wonder what all the parts of the plant are called? I wonder why a seed need roots and leaves? I wonder how the seed knows how put the root at the bottom and the leaf at the top? I wonder what happens if you turn a seed upside down when the root has just begun to grow? I wonder what happens when you turn the plant around so it’s facing the window from a different side? And watch how these sunflower seeds, from Temponaut Timelapse, emerge from the soil and dance. These resources look great, thank you! I hope you enjoy using them Sarah!